Even though Don Hoyt grew up in Gaylord, he never visited Bellaire until he met his future wife, a chiropractor from California who had moved to the Antrim County town for a job. That’s the thing about Bellaire – it’s not on the way to anything. People need a reason to go there. They’ve got one now. 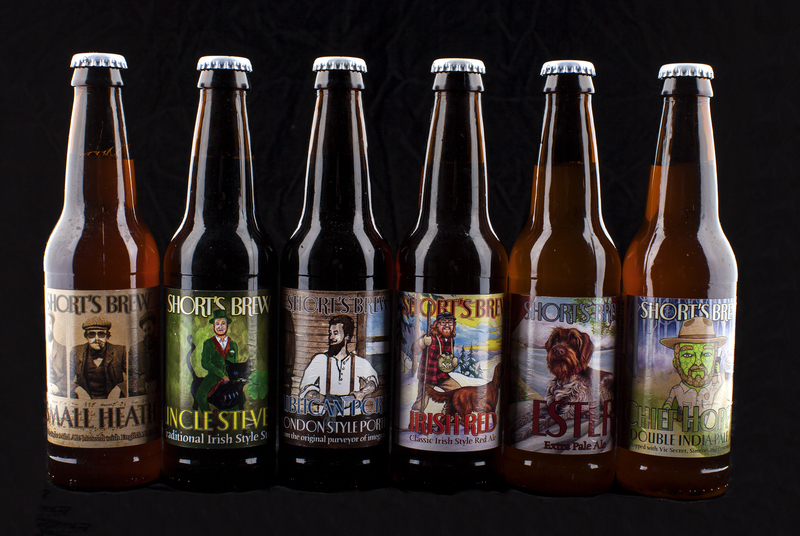 Since Short’s Brewing Company opened in April of 2004, what started out as an operation of seven employees led by Joe Short and his wife–to–be Leah has grown into a beer powerhouse with a national reputation. Today, Short’s employs 150 in Bellaire and at its bottling facility in Elk Rapids; the Shorts opened a “brewtique” in Bellaire in 2014 and expanded the pub last year to include a beer garden and seating for 460. Bellaire Village President David Schulz said when he travelled downstate 20 years ago, people didn’t know where Bellaire was. Now it’s famous. Bellaire isn’t the only place that’s seen economic revival through microbrews. Across northern Michigan – in Frankfort, Traverse City and Petoskey, for example – the beer business is booming. Hoyt’s first visit to Bellaire occurred 10 years ago when he and his then–girlfriend went to Short’s on their third date. The brewpub was young and its future uncertain. Hoyt said they had a blast, but the place was almost empty, and they worried it would go out of business. What a difference a decade makes. Now Hoyt, his wife, Dr. Kathy Hoyt, and their kids, five–year–old Amelia and three–year–old Tyler, live and work in Bellaire, and Hoyt said he’s watched the small town be transformed by Short’s. The microbrewery brings jobs and visitors throughout the year, including devotees from across the Midwest who visit as a sort of pilgrimage, and it’s made the town a more attractive place to live. Hoyt said he’s noticed other young families have moved into the village to be within walking distance of restaurants, shops and Short’s. He said it’s an appealing move even for people who don’t work at the brewery. He’s noticed the effect on the real estate market, too. Jamie Creason has also noticed Short’s allure for young adults. She owns the Applesauce Inn, a bed and breakfast five minutes outside of Bellaire. Short’s not only brings her a lot of business but also younger customers. Typical bed and breakfast lodgers tend to be in their 40s or 50s, but Creason is seeing more and more 20–somethings come to her door. That doesn’t mean they’re there to party, she explained. They tend to be beer connoisseurs who home brew and want to tour Short’s and taste some specialty beers to see what they can learn. A brewery that opened almost a decade later than Short’s is having a similar effect in Frankfort, another small town located off the beaten path. Steve Campbell, the general manager of Harbor Lights Resort, moved to Frankfort in the early 1980s and attended his senior year of high school there after his family purchased the resort. He moved back to Frankfort in 2005 after a career downstate and agrees that, like Bellaire, Frankfort is out of the way. Nonetheless, it seems more and more people are finding their way to Frankfort since Stormcloud Brewing Company opened in 2013. Since then, Campbell has seen Frankfort experience a renewal and reinvention. Campbell has notice how Strormcloud, which specializes in Belgian-inspired beers, attracts people who wouldn’t otherwise come to Frankfort. He credits Stormcloud’s success to how well it’s pulled off each level of the business, from the beer to the food to the atmosphere. Rick Schmitt, Stormcloud co-founder and co-owner, said he’s not entirely surprised by the impact Stormcloud has had on Frankfort, but he also said the success is like a dream. Stormcloud’s impacts on Frankfort are tangible and anecdotal. The brewery employs 40 people in the off–season and 65 in the summer, jobs that wouldn’t otherwise exist. “The intangible would be the people who come in and say, ‘Boy, I used to be able to park here in the fall or in the winter,” Schmitt said. Schmitt believes his brewery has also had a secondary effect on Frankfort’s economy. The jobs the brewery creates cause other jobs to be created as those people spend money in the community. And the people who come to Frankfort for beer inevitably spend money elsewhere on gas, coffee or at another restaurant. Schmitt believes the trickle–down effect goes even further, to businesses such as Betsie Bay Furniture, because some people only discover such shops because they’ve come to town to visit the brewpub. What’s important about Stormcloud’s revitalization of Main Street is that it lasts year round; it’s not just a summer event, a time when Frankfort is always crowded, said Frankfort City Manager Joshua Mills. Mills credits that to how Stormcloud has become a family gathering spot that organizes creative events to bring people together, things like trivia nights and curling competitions. And Stormcloud’s effect on Frankfort’s economy has only just begun. The owners have now broken ground on a production facility in the city’s industrial park on a prime 6.4–acre lot that’s languished for decades, since the park was developed in the 1970s. The property was owned by a downstate manufacturer who built a facility on another lot and ran a metal fabrication/plastic injection molding business until he died in the early 2000s and the factory closed. His family sold the building – today, part of it houses offices for Graceland Fruit and part of it is an entrepreneurial center with incubator kitchens and spaces for people who want to launch a business, including a fly rod manufacturer – but the 6.4 acres sat idle because the family never responded to requests from Frankfort officials or interested buyers for information about the lot. Over the years, Mills said he repeatedly left messages and wrote letters to the owners and never got a response. It was frustrating for officials who wanted to see economic development but were powerless to make anything happen. Then Stormcloud came along and was able to get the attention of the family and ink a deal. “(Stormcloud) paid a premium – the sellers weren’t going to budge, but Stormcloud really stepped in,” Mills said. Schmitt said the company will can beer at the facility for sale around northwestern Lower Michigan and Grand Rapids. Troy Daily moved back to Traverse City in early 2012. He’d opened a branch of the family business, Kilwin’s, in Williamsburg, Va., but the timing was inauspicious. The store opened in 2008 just as the economy tanked. Daily stuck it out for four years, and when he returned to Traverse City, he noticed a change. Something was brewing in his hometown. A beer economy was taking shape, and Daily sensed an opportunity. “I’m an entrepreneur, and I saw and heard about all these breweries opening, and I just wanted to work with them,” he said. To some, by 2013 or 2014, it seemed like Traverse City was already so crowded with breweries that the next one to open would be the last, but then another would open, and another, and another. Daily started a business that proved Traverse City has become a destination because of its vibrant microbrew scene. Daily first helped a friend launch the Traverse City Cycle Pub, the bicycle contraption that conveys flocks of drinkers slowly through town to bar after bar. Its success made him realize there were plenty of other business opportunities to be had. Daily soon launched the Traverse City Ale Trail, a promotion that advertises 10 breweries in the city and offers a pint glass for drinking at them all, but he wanted to go further. That led to the Brew Bus, a company that shuttles groups from brewpub to brewpub or from winery to winery, but he really struck gold with Paddle for Pints. “It was just an idea that came about after going, ‘Hey, we’re doing this on the cycle pub; how can we do it in the water?’” he said. Paddle for Pints launched in 2014 and has since grown tremendously. That first year, 80 people participated in events featuring kayak and bicycle tours of Traverse City’s drinking scene. Daily credits social media for the resulting explosion in popularity. People posted photos of the fun they were having, and other people decided they needed to sign up, too. In 2015, the number of participants in Paddle for Pints swelled to 1,200. Last year, it ballooned to 4,400. This summer, the 4,000 spots in the Paddle for Pints schedule sold out within an hour of going on sale Feb. 26. Daily conducted a survey of his customers last year, and in addition to learning that 86 percent traveled more than 75 miles to attend the events, he found that Paddle for Pints contributes significantly to the local economy: 81 percent of participants spent over $100 while in town, 46 percent spent over $300 and 23 percent spent over $500 during their stay. When Beards Brewery opened five years ago, co–owner Benjamin Slocum had a sense he and his partner were late to the microbrew market and that they’d better get in before it was too late. Today, he said, it feels like they’re seasoned veterans. Though Petoskey boasts far fewer breweries than Traverse City – there are only two in the city limits, Beards and Petoskey Brewing Company – Slocum said a craft beer culture has developed in Petoskey that has put the city on the beer tourist’s map. Beards has been so successful that the brewery is moving to a new location this spring that will be four or five times the size of its original home. Its new location will offer a full restaurant, space for three times as many customers and more room for brewing. (The company will keep its production facility in Charlevoix.) Beards will employ around 45 when the new facility opens. Slocum said he can see a beer culture developing in Petoskey the way it has in Traverse City, but perhaps not to the same extent. For instance, Petoskey is unlikely to get its own pedal pub. “We’re built on the side of a hill; the whole town is on the side of a hill,” he explained. And while there might only be two breweries, other bars in Petoskey offer excellent selections of beer, something that was not the case when Beards opened in 2012. In addition to offering employment opportunities and drawing tourists, Slocum said breweries have other positive effects on local economies, too. Brewers like Beards use grains, hops and produce from nearby farms, and they spend money on construction. Beards is even lending a hand to Michigan’s manufacturing sector. Slocum explained that Beards bought its brewing equipment from Craftwerk Brewing Systems in Lake Orion and its canning equipment from microcanner [sic] in Rockford. Joe Short didn’t start out aiming to create an economic renaissance in Bellaire. His success didn’t necessarily follow a plan. It followed a passion. Short started out wanting to make great, creative beer, and he wanted to do it in Bellaire because he loved the place, not because he thought it was the best location for a brewpub. But the success of his business isn’t really a surprise to Short, either, because from the beginning, even though he started out against the odds, everything seemed to click. Most significantly, he met his wife as he opened the business. Leah was his deli manager before she was his partner.